OS91 received these photos from overseas! A member of the German Armed Forces who served in Afghanistan was given a Psalm 91 card while deployed. He carried it with him while there. 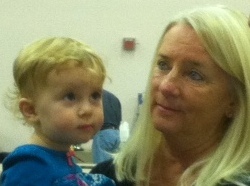 What a joy to receive an email and these photos from him! Special Delivery! To very special Firefighters! 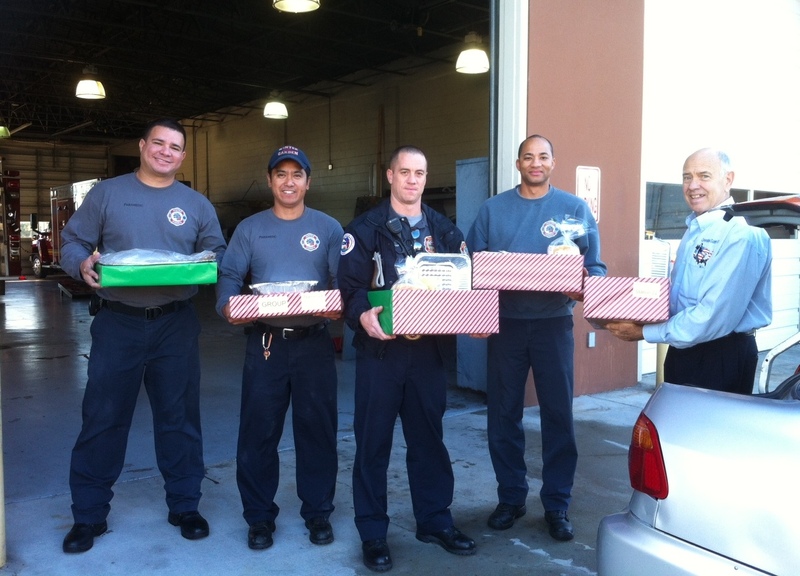 Yes, OS91 loves our own Winter Garden Firefighters and we are honored to take this Thanksgiving holiday to show them in a very tangible manner. This afternoon, OS91 cooked, carved, and delivered two turkeys, stuffing, gravy, sweet potato casserole, corn, rolls and butter, cranberry sauce, tomato juice, iced tea, pie, and whipped cream to our hometown heroes at Station 24. 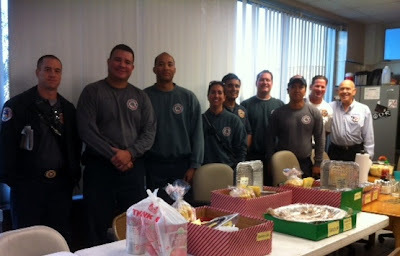 Firefighters from the other Stations in Winter Garden were on their way or had already arrived to celebrate this wonderful holiday together. Of course, along with Dinner, we took the opportunity to leave some Psalm 91 cards and Books for anyone who hadn't received them before! May God protect you all as you serve us! Thank you for all you do for us! And special Thanksgiving wishes to our friends, Winter Garden Fire Chief John Williamson and Deputy Chief Matt McGrew! New Hope Christian Academy (NHCA) in Minneola, FL http://newhopeca.org/page1.html is an outstanding nondenominational private school, founded in 2004 utilizing the highly acclaimed "Accelerated Christian Education", (or "ACE"), curriculum. The focus is on helping each student to see themselves as God sees them and for them to reach their potential using the strengths that God has given to each of them. 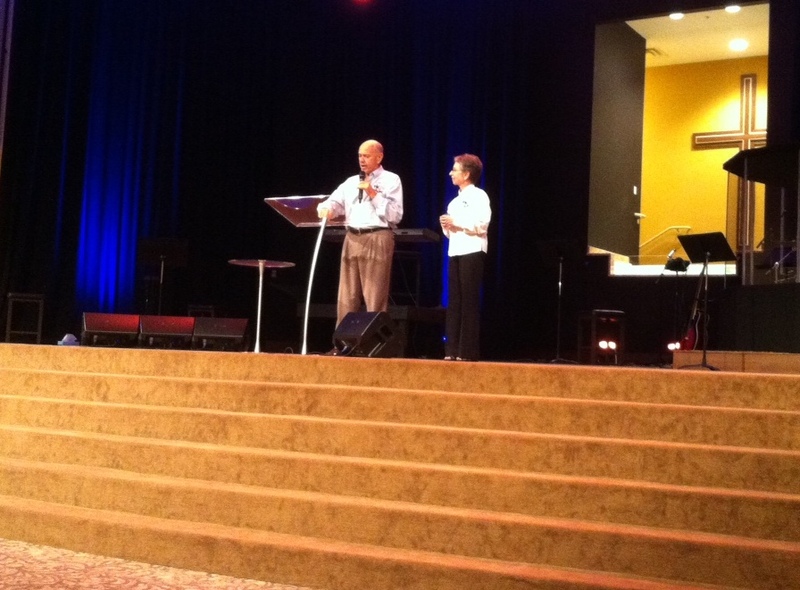 Ed and I have been privileged to serve on the Board at New Hope for several years. One of the highlights of the year is NHCA's giving back to the parents in the fall by providing a delicious Thanksgiving Dinner for them to enjoy together with their children and the teachers. 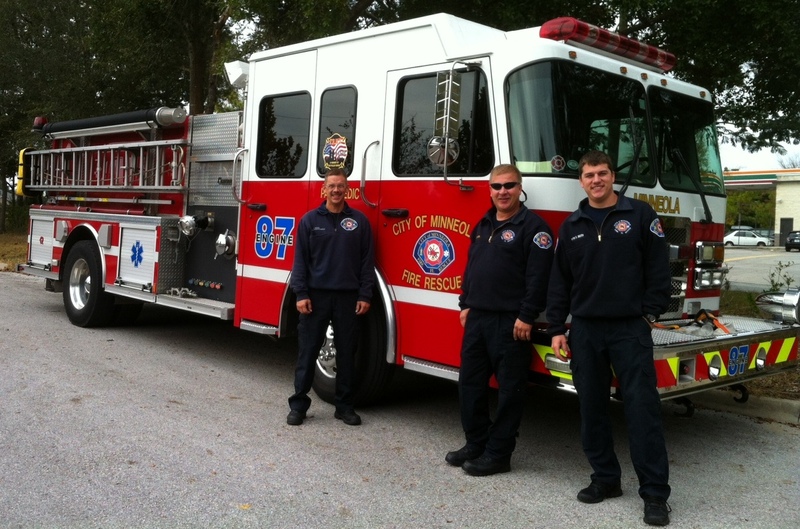 And to top it off New Hope invites the local Minneola Firefighters to join us as we thank God and enjoy His blessings. 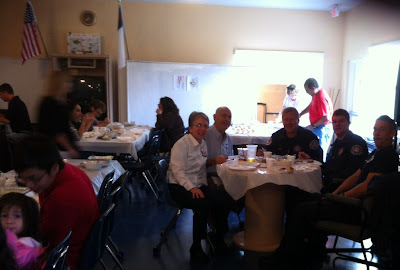 A heartfelt thank you to all who made today's Thanksgiving Dinner possible, to Mrs. Angi, Principal and Founder of NHCA, Mr. Rusty, her husband who definitely is an award winning cook, and to our local Firefighters who are always there for us at a moment's notice. Happy and Blessed Thanksgiving to you all! What a blessed evening OS91 had with First Assembly Church of Deland, FL http://firstassemblydeland.com/ and Pastor Mike Modica! 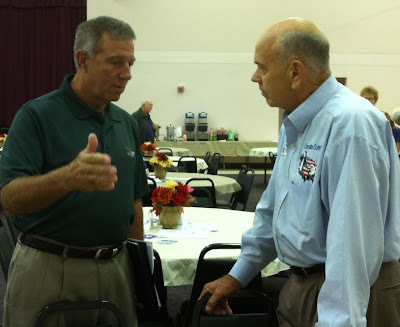 Thanks to a Divine Connection with Chaplain/Deputy Mike Dye of Volusia County Sheriff's Office and Florida Head of the Fellowship of Christian Police Officers (FCPO), OS91 was invited about one month ago to this, his home Church, where the FPCO Annual Conference was being held. It was at this time that we were introduced to his Pastor, Mike Modica and the rest is history! 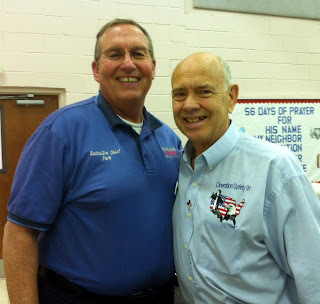 First Assembly Deland is a very patriotic Church beginning with the Pastor Modica, who is a Veteran of the U.S. Army and whose son, Sam, is a Marine, deploying soon to Afghanistan. Before the Service, we were invited to join Pastor Mike in his Office where we shared prayer and a bit of fellowship. It was here we spotted a photo of his brave son (below). 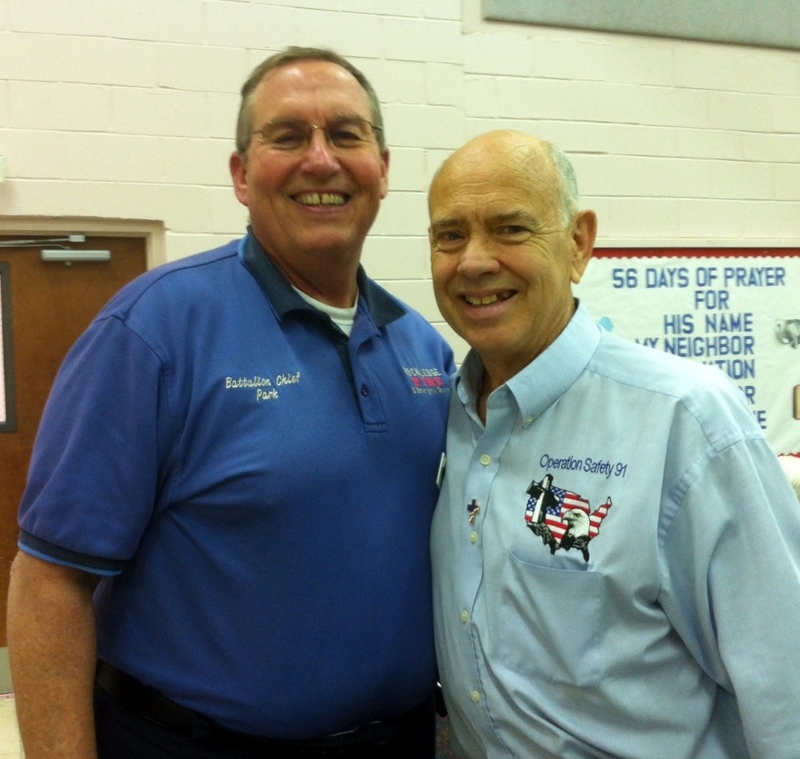 Among the Responders we met were Pastor Mike Carroll also of First Assembly Deland who serves as Chaplain in Volusia County Sheriff's Office. Mary was honored to share dinner and speak at length with another Deputy of VCSO, former Military, during dinner. 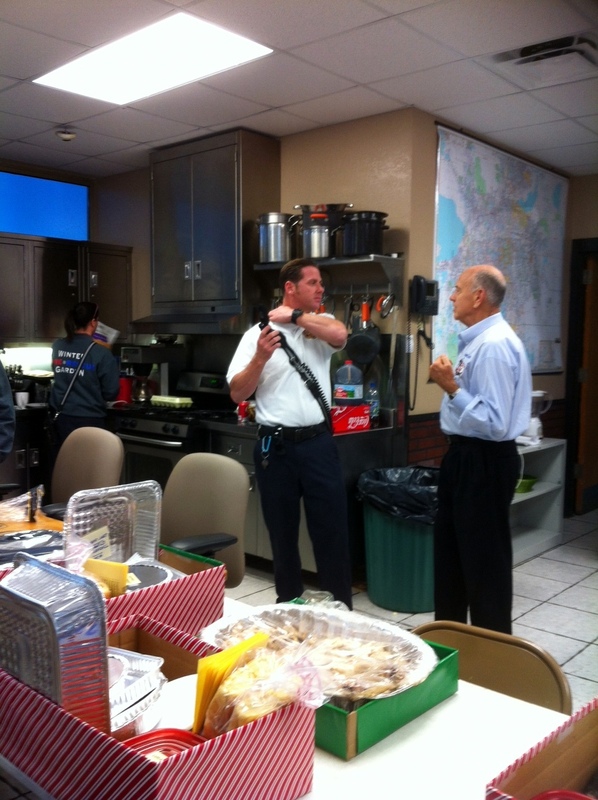 Also we met a Fire Marshall/Assistant Chief who very gratefully accepted a Psalm 91 card. 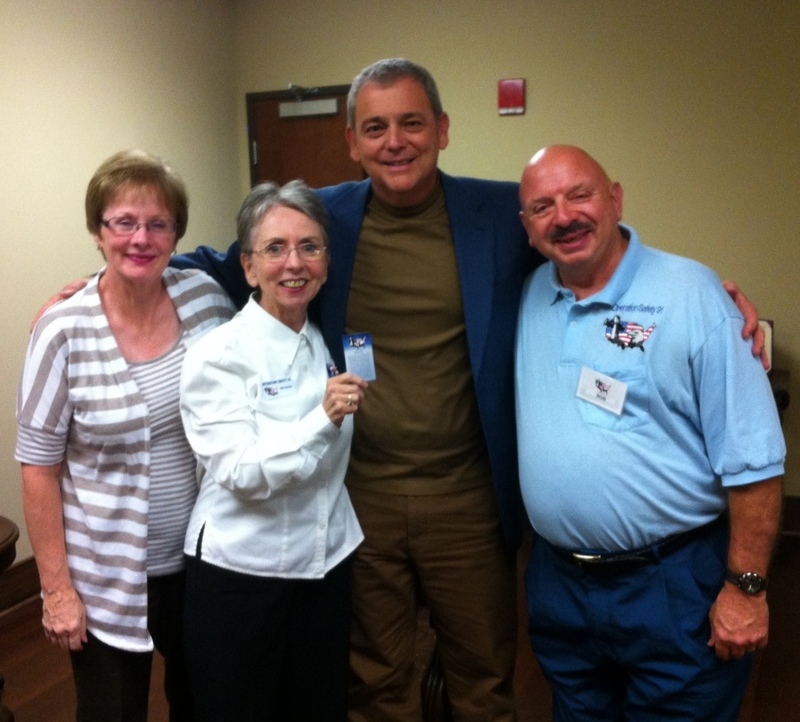 After speaking, Pastor Mike handed Ed a check for OS91 which can make over 25,000 Psalm 91 cards. 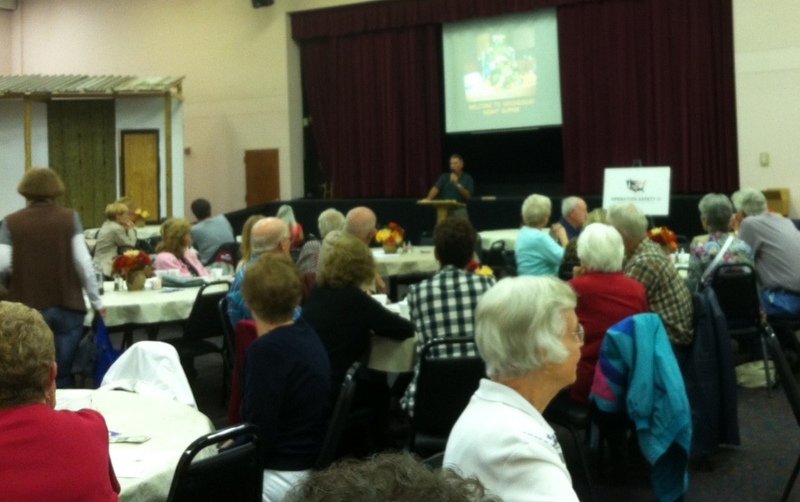 Thank you, Pastor, and all those at First Assembly, Deland, for your overwhelming generosity to us. We are so very grateful to you. 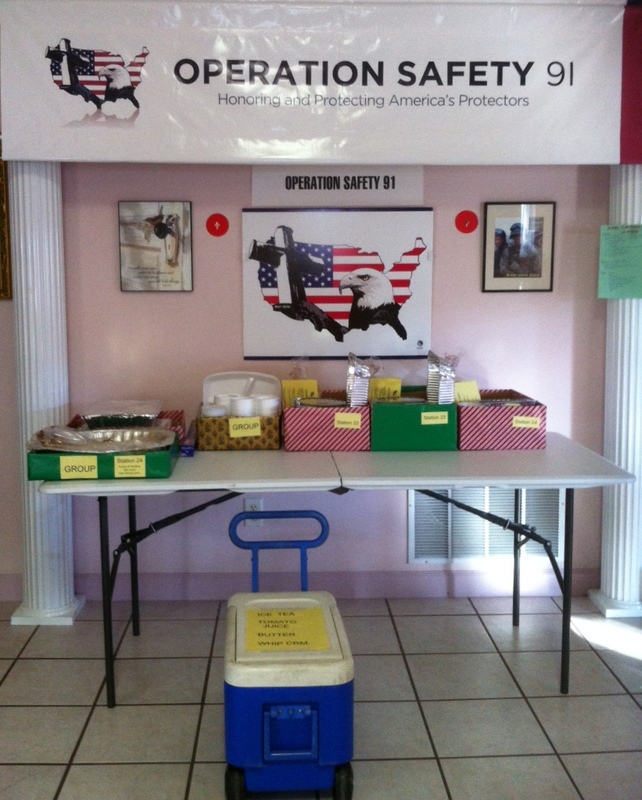 Thank you so very much for your partnership with OS91 to help get Psalm 91 into the hands of Responders for their protection! We appreciate you! "Together we can do so much more than separately!" 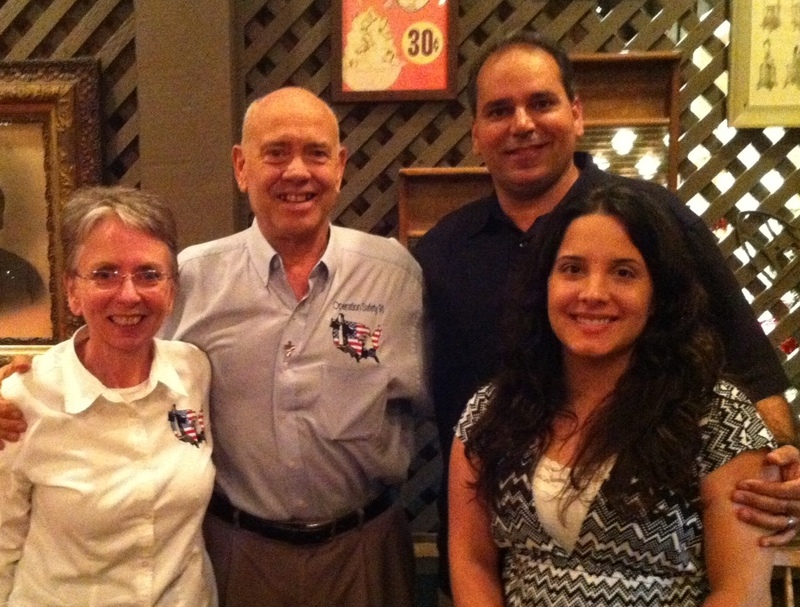 Yesterday, Veterans Day, we were so honored to meet, spend time, and fellowship with Jorge Diaz, co-founder of Officer of the Lord Ministries, http://officerofthelord.com/, his lovely wife Patricia and their new little girl, Victoria, in West Palm Beach, FL. Jorge is a Police Officer with West Miami Police Department and retired Veteran of Miami-Dade County's Hialeah Police Department. 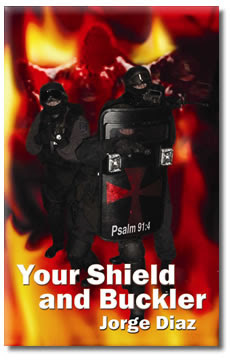 He is also author of an outstanding Psalm 91 book geared specifically for Police, Law Enforcement and SWAT: Your Shield and Buckler. 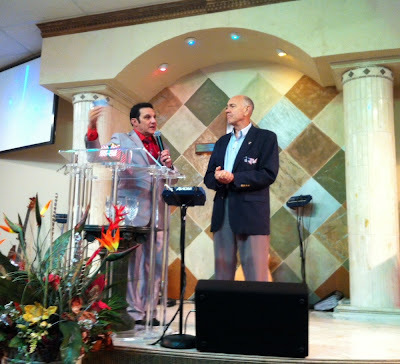 Jorge and we were connected through Don Aldridge, Chaplain for Orange County Sheriffs Department and this is truly a Divine connection! Jorge will be the Keynote Speaker for Operation Safety 91's 5th Annual Tribute to Honor America's First Responders to be held at the Rosen Centre on International Drive in Orlando, Florida on February 22, 2013. 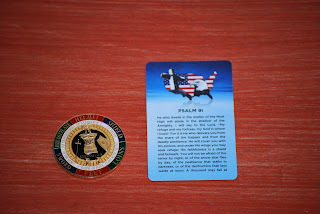 OS91 is so very grateful that the Lord has connected us with Jorge, who has such a heart to reach his fellow officers with the life saving message of Psalm 91. We believe with all our hearts that during this 5th Annual Tribute, God will use Jorge to make this message real to them! Christ Family International Church http://cfichurch.com/ of Port St. Lucie, FL, is Operation Safety 91's premiere Church partner. 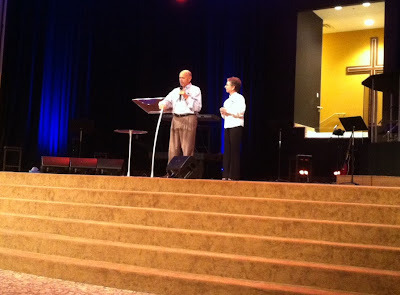 Both the Pastors, Gerry and Donnelyn Khourie and the Congregation have been outstanding supporters of OS91 for two years now. 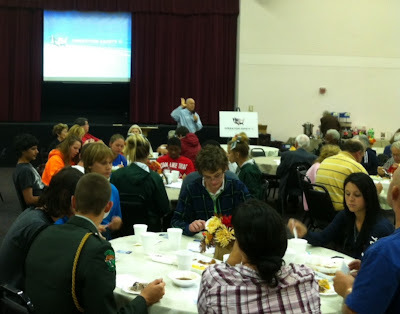 Yesterday, Veterans Day, we were privileged to spend time with this Church , not only speaking during their two Services, but also enjoying family time together afterwards at their "Harvest Celebration", an all out fun time fellowship/cook out on their campus at 6501 NW St. James Rd. 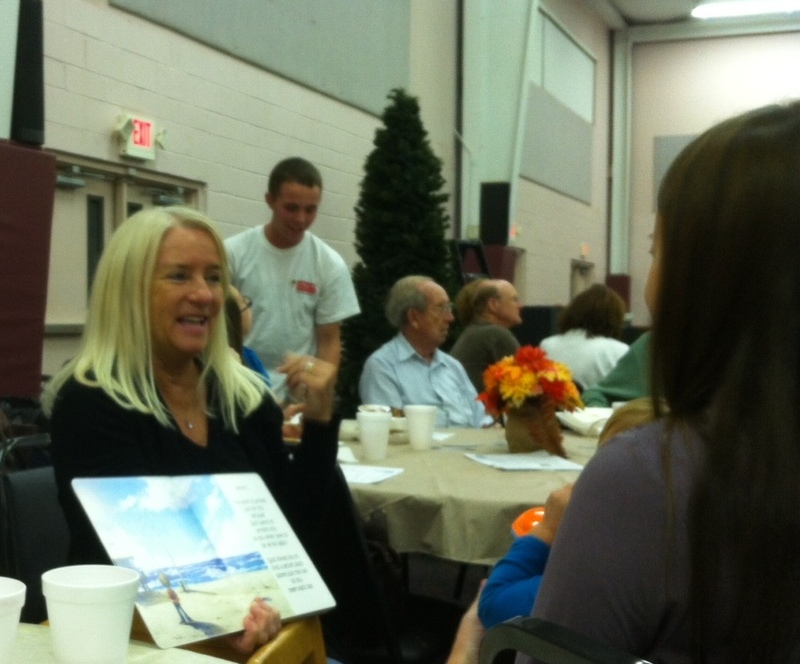 OS91 was able to set up a table again and offer an opportunity to our CFI partners to give a Christmas gift of Psalm 91 cards to Responders whom they would never know in this life. 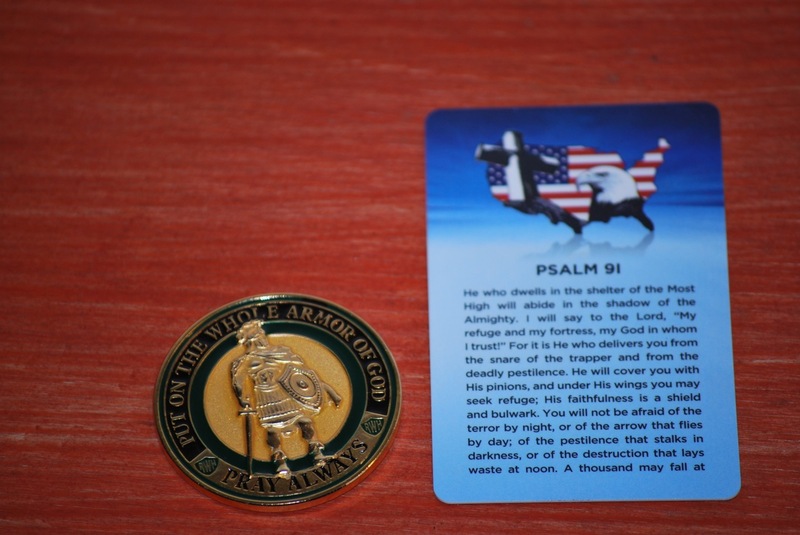 The Pastors and people responded so generously that OS91 will be making an order of between 25,000 to 50,000 more Psalm 91 cards with the monies donated. 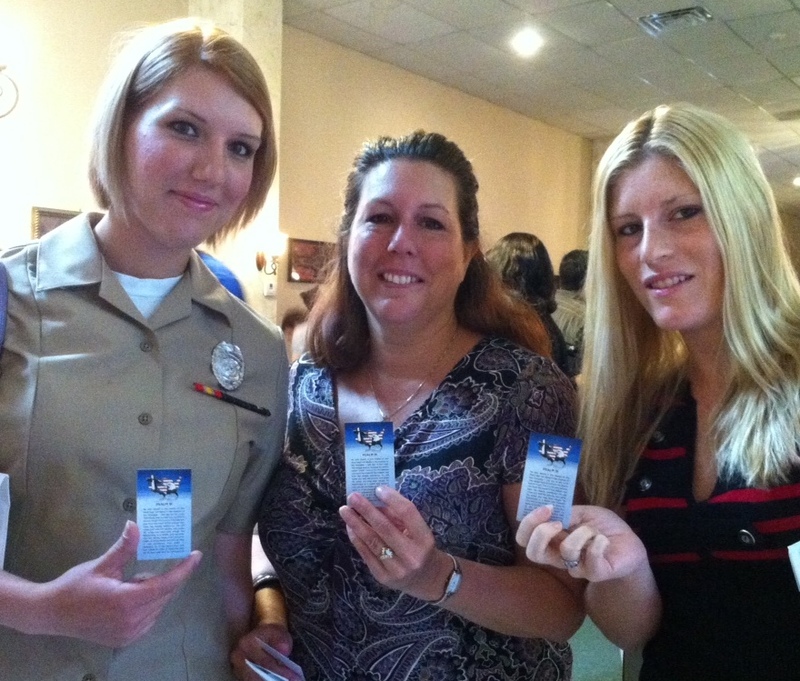 Card were made available to anyone who wanted them or any Responders in attendance. The young Navy Responder pictured above just flew in during the wee hours of the morning to be reunited with her mother and sister. 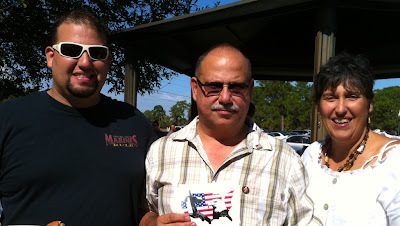 While in line for some good food, I met the young man on the left, Miguel, who was wearing a Marines shirt. He told me his dad was a Marine and took me out of line to meet him. What an honor! 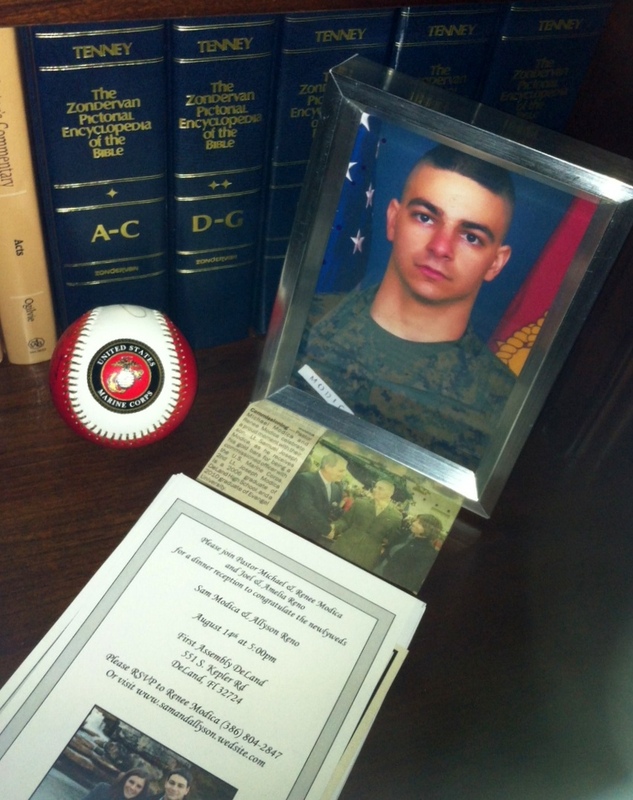 Then, he found the picture in his phone of his cousin's Jeep with PSALM 91 written on it! That was a "must have" photo for me. Miguel told me he was going to have that done on his vehicle as well. I couldn't wait to share this photo (below) with you on this blog! 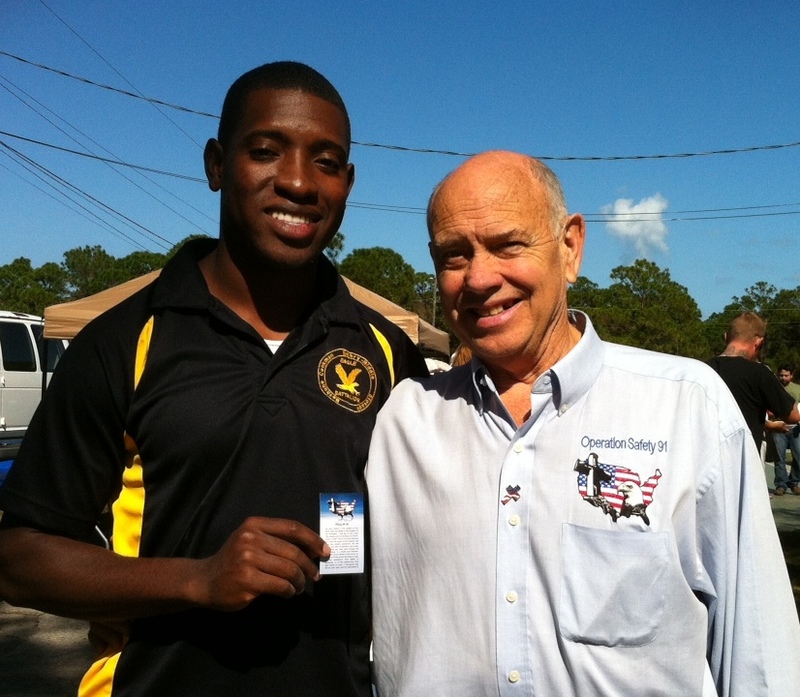 Ed also spent time with a young Responder pictured above who just joined the U.S. Army. 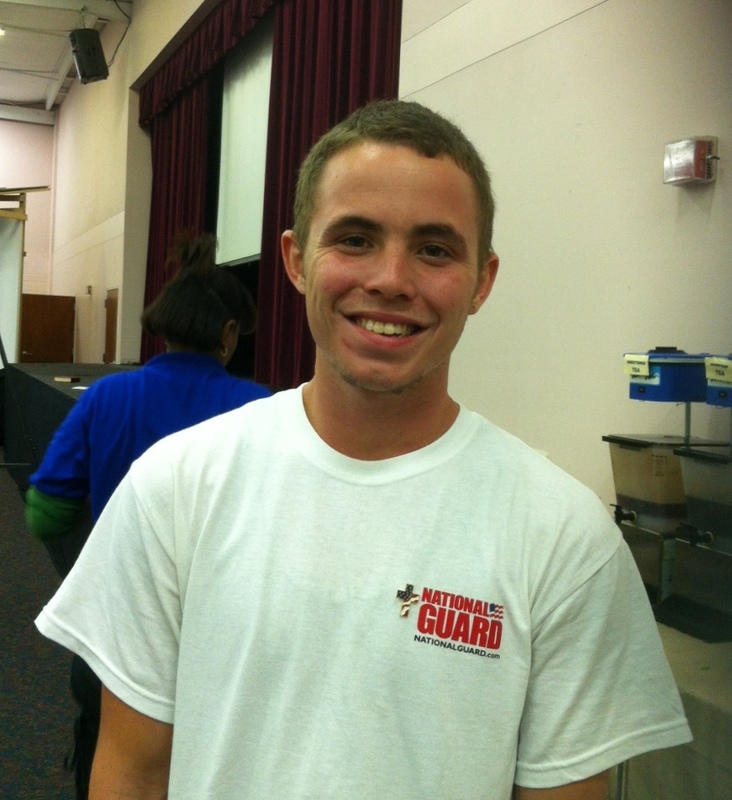 Isn't he a fine looking young man? We so appreciate him and all the hundreds of thousands of Responders: Firefighters, EMS, Law Enforcement, and Military, who risk their lives daily to protect, rescue and defend us! Thank you all so much! This past Saturday OS91 made a new partnership to reach our Troops with the life saving message of Psalm 91! 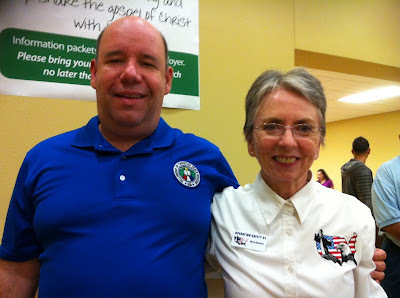 Operation Shoebox www.operationshoebox.com - Supporting Our Troops is a 501(c)3 non profit Organization located in The Villages, FL and we met Sandy DeChristofaro, VP/Director at St. Timothy's Church on Saturday. An immediate connection was made and we handed a package of 500 Psalm 91 cards to her for their Care Packages to the Troops. 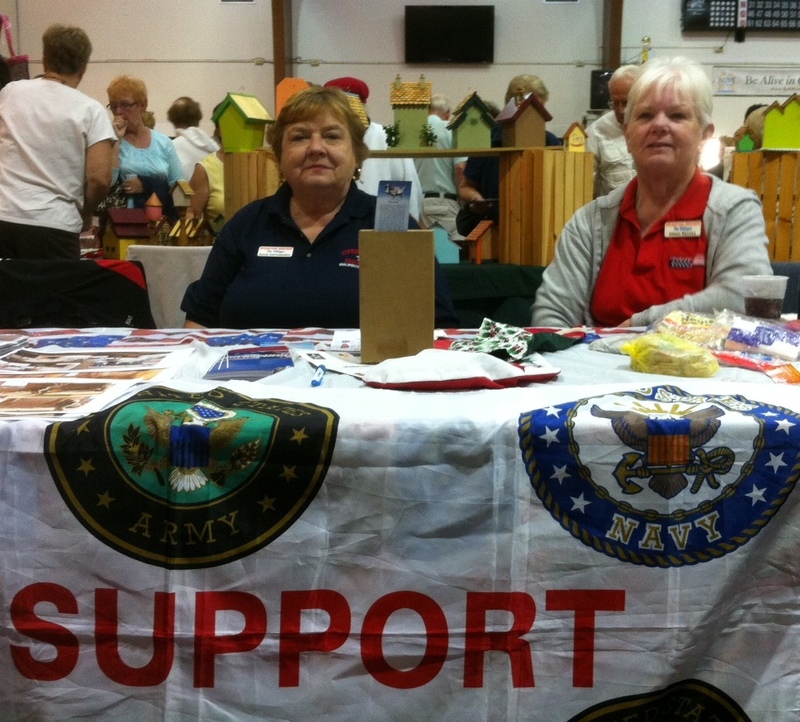 If you look closely in this photo, you will see this box of cards on the table in front of Sandy, with a Psalm 91 card on top. 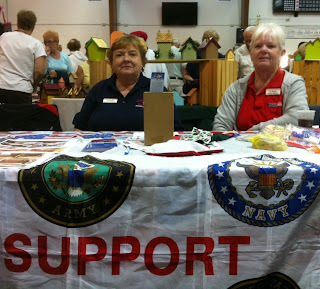 Thank you to all our partners and supporters for your donations to make cards. 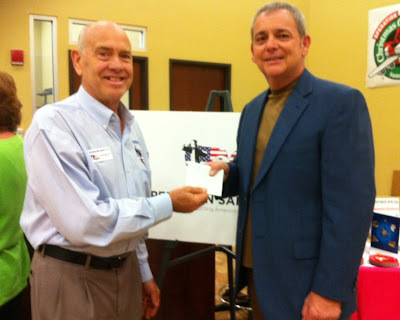 Here is one more partnership made to reach our Responders! OS91 is so blessed to have COL Danny McKnight, U.S. Army (Ret.) as our National Spokesperson! Tonight, through COL McKnight and the gracious invitation of Dr. Charles Horton, his Pastor, Ed and Mary were invited to 1st Baptist Church of Cocoa (http://www.cocoabaptist.org/), to speak to the congregation about Operation Safety 91. 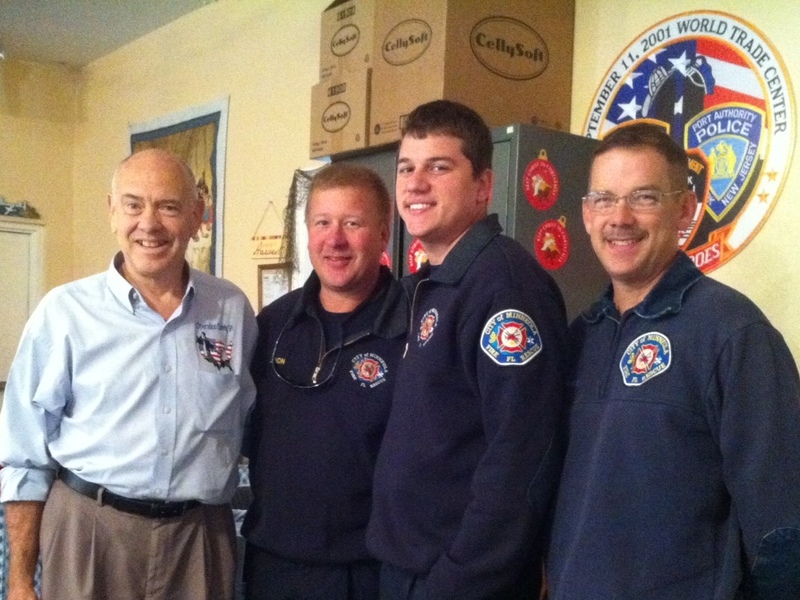 COL McKnight cares deeply about Responders and is very actively involved in promoting OS91's mission to honor and protect America's Protectors: Firefighters, EMS, Law Enforcement and Military. COL has a real heart for what we are doing. 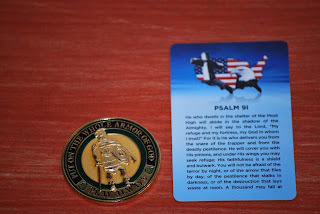 In fact, not only does he promote us on American soil, he has been to Afghanistan twice this year...right in the heart of the battle... and took Psalm 91 cards with him to distribute to the Troops. One of the greatest honors Ed and I have ever had was tonight, when COL McKnight introduced us as he would normally and then added, "And they are even much more than an Organization I promote; they are very, very good friends." Thank you, COL, so much! We appreciate and love you! Of course there are always Responders around and we make sure they get a great big "Thank you for your service!" 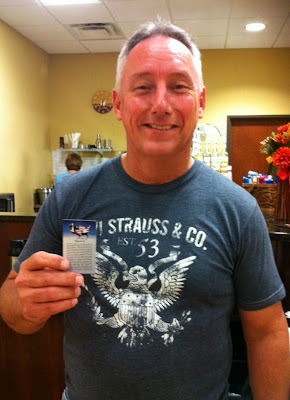 and a Psalm 91 card! And there were some future Responders present as well, one young man in ROTC uniform, who is following in his father's footsteps and joining the Army, and another, serving at table pictured above. Ed and I were honored to share some family time with Linda McKnight, daughter Katie and granddaughter Olivia, who stole the show! 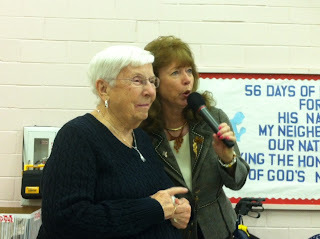 Happy Birthday: 88 Years Young! Last but not least! 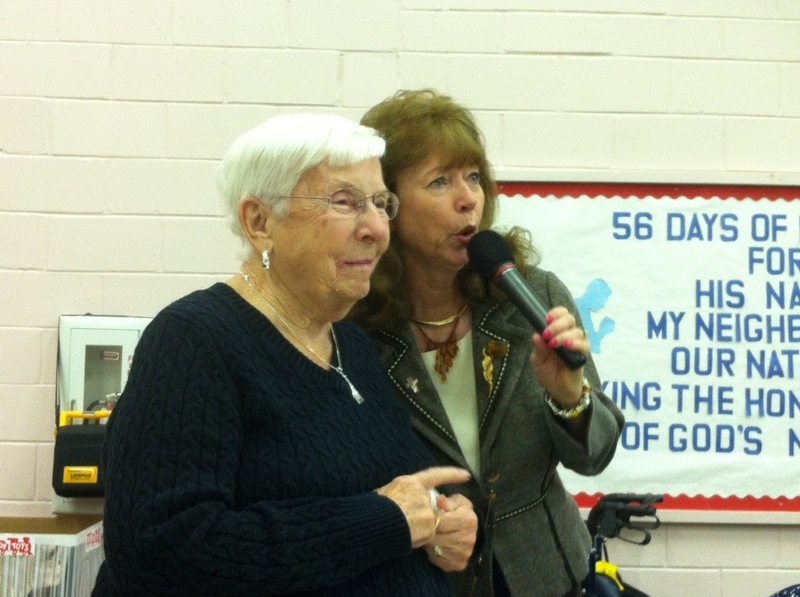 Linda McKnight's mother, Virginia, celebrated her 88th Birthday today! Happy Birthday! All in all it was a wonderful night and OS91 thanks God for the McKnights, Dr. Horton, and for the partnership of First Baptist Church of Cocoa!